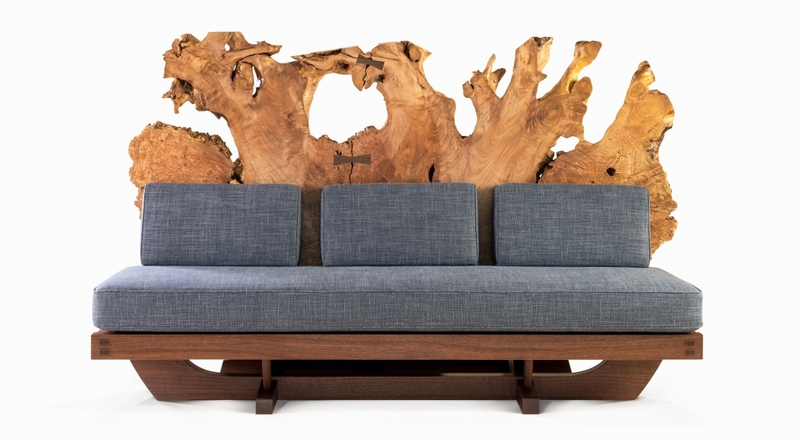 Mira Nakashima (b 1942), Tsuitate Sofa, designed in 2015, made in 2018. American black walnut, Oregon maple burl root, upholstery. Height 46 by width 75 by depth 37 inches. George Nakashima Woodworkers. DOYLESTOWN, PENN. 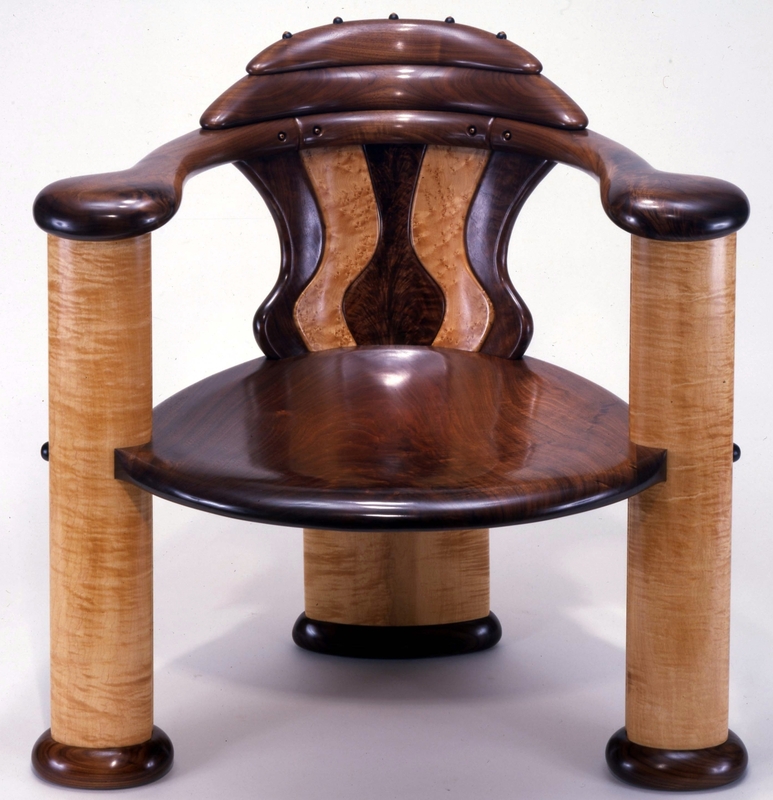 – The Michener Art Museum presents, “Nakashima Looks: Studio Furniture at the Michener,” an unprecedented collection of modern and contemporary craft furniture curated by renowned artist Mira Nakashima-Yarnall. 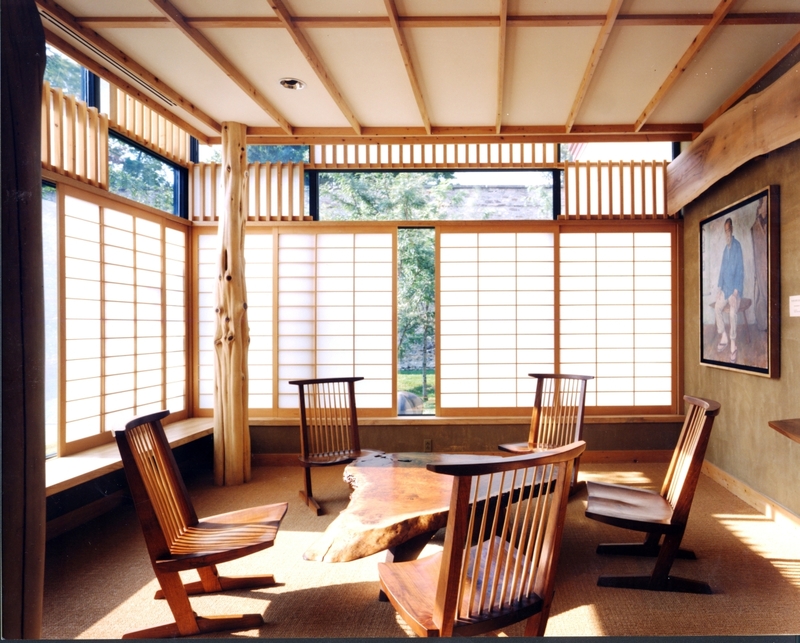 Rooted in its deep commitment to George Nakashima’s legacy, the museum collaborates with his daughter Mira, to pay homage to Bucks County’s rich history of the studio craft movement and the many artisans from the region. Encompassing more than 20 objects, the show includes works from the Michener’s permanent collection by such renowned artists as Paul Evans (1931-1987), Jack Larimore (b 1950), Mark Sfirri (b 1952) and Robert Whitley (b 1924), along with loans by Harry Bertoia (1915-1978), Wharton Esherick (1887-1970), Sam Maloof (1916-2009) and both generations of the Nakashima family. Astutely aware that the woodworking field has been comprised mostly of men, Mira also felt it important to include work by Noémi Raymond in the exhibition. “Nakashima Looks” includes three works by Wharton Esherick, founder of the American Studio Furniture movement, representing his idea of wooden furniture as sculpture. 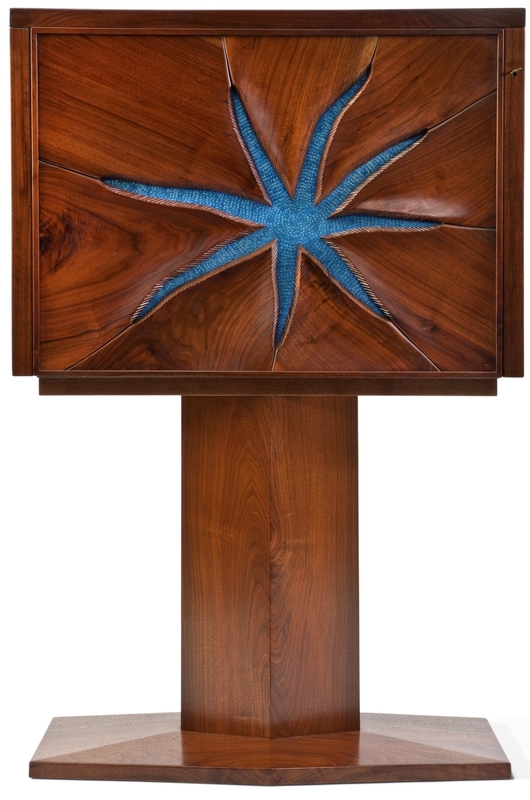 Developing independently, George Nakashima focused on architecture-based furniture and used the natural shape of the wood to dictate form, especially highlighted in the Music Stand (1985), one of his four works on display. 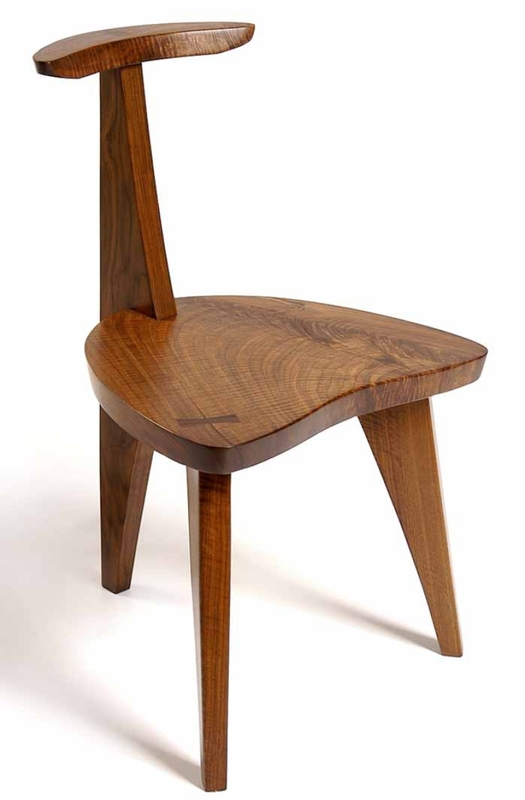 While both influences spread, many of these woodworking craftsmen now being showcased together, were reacting against factory-made furniture being produced at the time, often blurring the line between functional furniture and sculpture. A few of them, however, eventually worked with Hans and Florence Knoll, selling design rights and helping to shape the future of furniture design in the Twentieth Century. “We are very grateful to the Michener Art Museum for asking us to design and build the memorial room for my father in 1993, and for their continued interest in our work as a part of the ongoing artistic community in Bucks County and beyond,” states Mira Nakashima-Yarnall. 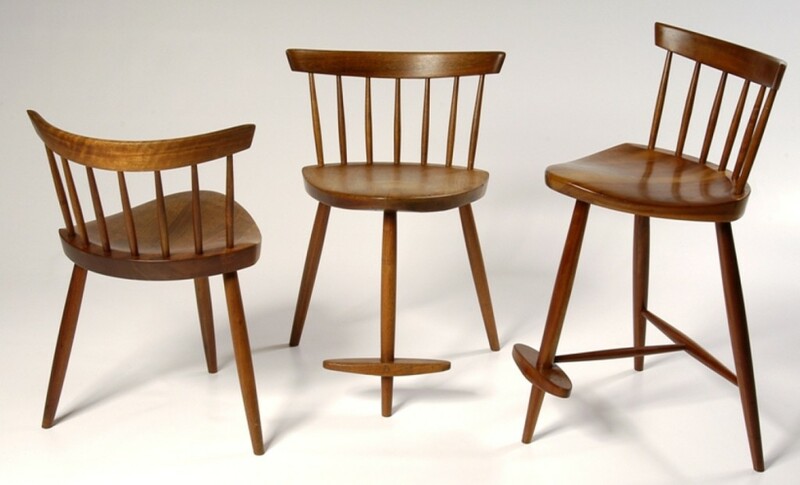 George Nakashima (1905–1990), three Mira Chairs, circa 1952. American black walnut and poplar. Heights are 24½ by width 19 by depth 19 inches; height 28½ by width 19 by depth 19 inches; height 33 by width 19 by depth 19 inches. 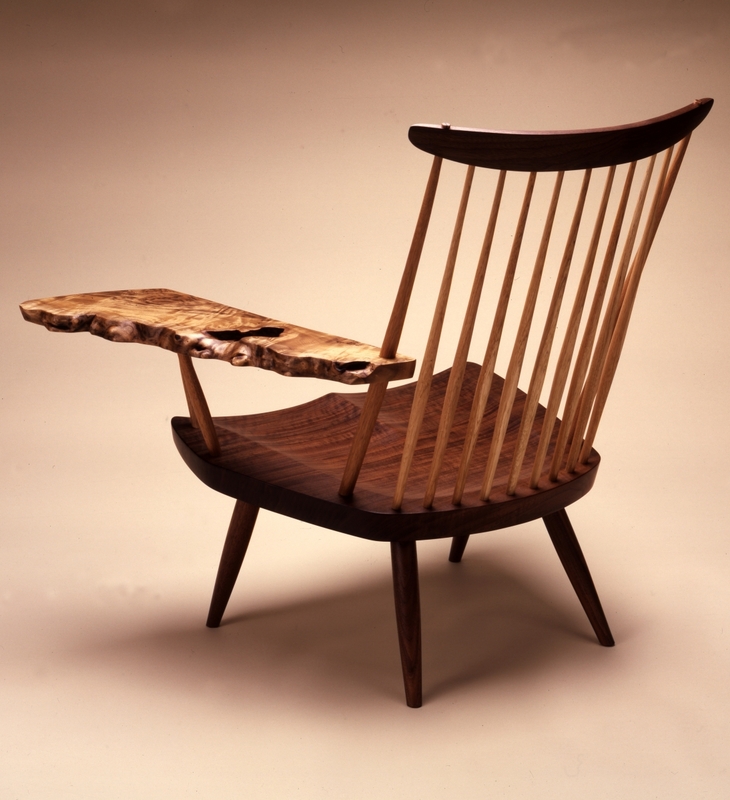 George Nakashima Woodworkers. After the start of World War II, when Mira Nakashima was just 6 weeks old, the family was uprooted from their home in Seattle, Wash., and relocated to an internment camp with other American citizens of Japanese ancestry. Antonin Raymond (husband of Noémi Raymond), an architect who had employed George years before while living in Japan and then also back in the United States, petitioned for the release of the Nakashima family, ensuring employment on his chicken farm in New Hope, Penn. Although he had many accolades, including degrees from the University of Washington and the Massachusetts Institute of Technology, and practiced as an architect for several years, George began mastering the art of woodworking while working on the farm. He believed trees had souls and saw importance in highlighting the natural forms of the tree in his custom designed functional furniture. Following completion of architecture degrees from Harvard University and Waseda University in Tokyo, Mira Nakashima returned to work in her father’s studio in 1970. She has remained at the helm of Nakashima Woodworkers since her father’s passing in 1990. While faithful to continue making her father’s “classic” designs, she, as an artist herself, has developed and experimented with new methods in response to client requests. “Nakashima Looks: Studio Furniture at the Michener” remains on view at the museum through July 9. The Michener Art Museum is at 138 South Pine Street. For more information, www.michenerartmuseum.org or 215-340-9800. Nakashima Reading Room. James A. Michener Art Museum.